Many of the volcanoes in California are listed by the USGS to have been active approximately 10,000 years ago. Upon which side of our warning - to anticipate all volcanoes active within the last 10,000 years to erupt - does this fall? In southern California the Amboy and Salton volcanoes appear relatively inactive, with 10,000 and 14,000 years respectively since last activity per the USGS. 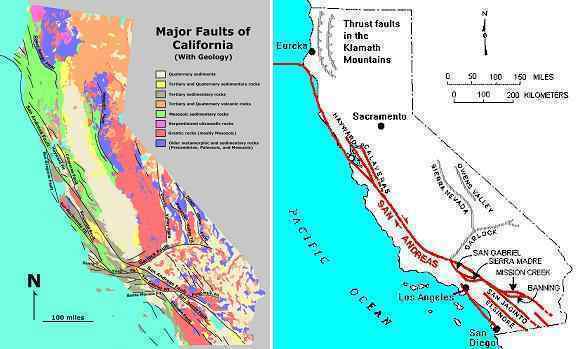 But note their close proximity to many fault lines and the San Andreas itself. Though the San Andreas is considered a slip-slide fault, devastating only on the fault line itself, the New Madrid adjustment will do more than move the land up or down along the San Andreas. It will create pressure in the region jumping west during the diagonal adjustment, and this includes all lands to the south of Mammoth Lake. Thus Amboy and Salton should be watched, during the New Madrid adjustment, with evacuation of the immediate area upon any signs of activity. We have clearly indicated that Mammoth Lake in California will rupture during the New Madrid adjustment, with land south moving west with Mexico and land north of this point remaining in place. This caldera is estimated by man to have been active within the last 1,400 years, due to its placement on a fault line running from San Diego to Yellowstone. We have also stated that the Siskiyou Mountains in Washington State are hardened rumpling, unlike the ongoing rumpling in the Cascades nearby. Clear Lake and Shasta, with the USGS estimate of 10,000 and 9,500 years since activity, are showing this relative stability, but should still be watched. If the New Madrid adjustment occurs, get off the mountain! It is the Cascades and to the north where certain and aggressive eruptions start, due to the subduction of the Juan de Fuca Plate. We have stated that the West Coast will adjust shortly after the New Madrid adjusts, in step with the Hoover Dam shattering. Of the volcanoes listed by the USGS on their maps, when the New Madrid adjusts, one should be 100 miles from Lasson, Medicine Lake, Hood, Jefferson, Three Sisters, Newberry, Crater Lake in Oregon, and Baker, Glacier Peak, Rainier, St. Helens, and Adams in Washington State. Garibaldi in Canada bears close watching, as do the more active volcanoes up along the Canadian coastline.